Another busy day with lots of walking. 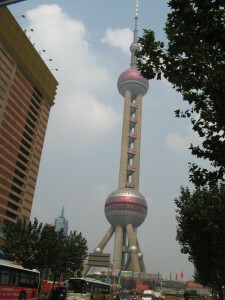 Our first trek was to the Pearl TV tower. Something I have avoided mentioning so far is the publicity for the 2008 Olympics. It is everywhere, including days, hours and minute signs, especially in Beijing. The Special Olympics ended here in Shanghai yesterday. We took the elevator up to the second pearl which was approximately 260 meters up the tower. We walked around and took some pictures but the smog pretty much limited the picture taking. From this high elevation it was even more astounding how much new building construction was taking place. After going around once we took the elevator down to the basement levels and viewed the Shanghai history. There were many dioramas depicting life in Shanghai over the past 200 years. It was very well done and educational. We stopped for lunch at the Super Brand Mall nearby. We couldn't resist going to Starbucks for a sandwich and a large cup of coffee. Looking into this multi storied mall you can imagine that we were back home and not in China. Every major high end brand store you've ever heard of and ten times more. The place was packed with young people. We then took the subway to the Shanghai Museum located in Peoples Square. Even at one o'clock the subways were full of people. The subways and trains were very well kept up and clean. Traffic was not as bad as I was led to believe. You just have to keep an eye out when leaving the curb for ALL wheeled traffic coming from all directions. Again the number of tall buildings is impressive and is such a contrast to the small towns and villages that we visited and saw at the start of our vacation two weeks ago. The Shanghai museum is probably the most interesting and complete Chinese museum that we have visited so far. There are four floors of exhibits from modern day minorities clothing, to ancient pottery (3800 BC), to Bronze works from 2000 BC, Silk paintings, Ming and Qing (pronounced Ching) dynasty furniture, the former were straight lined and lighter while the latter was heavier and ornately carved. A special exhibit of art from the Prado was also there with Titians, Greco, and Goya works among others. There were other exhibits, but that is all I can remember right now. After I go through the tons of pictures I am sure I will remember some of the others. After coming back to the apartment for a short rest we took a cab to Xin Tian Di, a converted warehouse area in the middle of Shanghai proper. We had another excellent dinner, appetizers of smoked duck, and a marinated carrot roll, sweet peanuts and sweet river shrimp, followed by a couple plates of green veggies, Braised pork and steamed rice and crab in the shell. Dessert was crepes filled with sweet red bean paste. Entertainment was provided by the maitre d' who was animated, loud, cheerful and funny, deftly managing a continuous line of people clamoring to get in for dinner. Another surprise was the large number of westerners who spoke fluent Chinese. We were told that many people who come here as students like it so much that they stay. We walked around Xin Tian Di observing the night life, walked past the location of the first party congress and caught a cab back to the apartment. the birthplace of China's Communist Party. Pop in for a quick look at the room where Mao and company conceived their grand plans.